Moong dal / lentil – 60gms. Cumin seed / jeera – 1 tsp. Green chili – 2 pc, sliced. Tejpatta/bay leaf – 2 pc. Oil for frying – 10 gm (2 tsp). Green chilies – 2, sliced. Ghee (clarified butter) – 1 tsp. Roast the pulse till light golden in colour. Next, cut the potatoes and cauliflower into big chunks. Take a frying pan and pour some of the oil in it. Fry in it the potato and cauliflower pieces. Fry till golden brown. Keep to a side. Pour the rest of the oil in the pan and heat it. Add the cumin seed, bay leaf and let it sizzle. Add the rice and stir well. Add the dal, the rest of the spices and water. Put the lid over the pan. Cook the dal (pulse) and rice are completely. See that they have a semi-solid consistency. 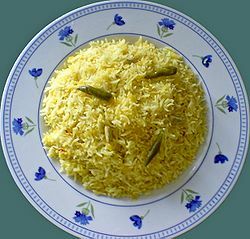 Pour 1 tsp of ghee over the cooked rice and dal. Next, add the sliced green chilies. Also pour in the fried cauliflower and potatoes. Serve hot. Make balls of whatever size you like and put aside to cool. Serve.